You can count on Rick Steves to tell you what you really need to know when traveling in Dubrovnik. 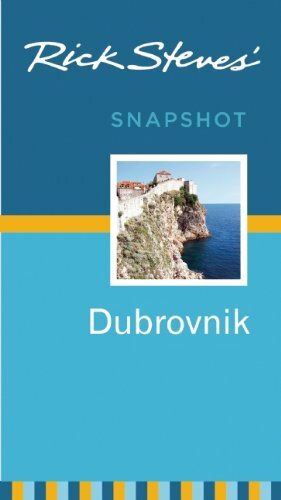 In this 168-page compact guide, Rick Steves and Cameron Hewitt cover the essentials of Dubrovnik, including Pelješac Peninsula, Mljet National Park, and Trsteno Arboretum. Visit Dubrovnik's main promenade known as The Stradun, or stroll the scenic mile-and-a-quarter around the city's town walls. You'll get firsthand advice on the best sights, eating, sleeping, and nightlife, and the maps and self-guided tours will ensure you make the most of your experience. More than just reviews and directions, a Rick Steves Snapshot guide is a tour guide in your pocket. Rick Steves' Snapshot guides consist of excerpted chapters from Rick Steves' European country guidebooks. Snapshot guides are a great choice for travelers visiting a specific city or region, rather than multiple European destinations. These slim guides offer all of Rick's up-to-date advice on what sights are worth your time and money. They include good-value hotel and restaurant recommendations, with no introductory information (such as overall trip planning, when to go, and travel practicalities). Rick Steves has spent 100 days every year since 1973 exploring Europe. Rick produces a public television series (Rick Steves' Europe), a public radio show (Travel with Rick Steves), and a podcast (Rick Steves' Audio Europe); writes a bestselling series of guidebooks and a nationally syndicated newspaper column; organizes guided tours that take thousands of travelers to Europe annually; and offers an information-packed website (Ricksteves.com). With the help of his hardworking staff of 70 at Europe Through the Back Door—in Edmonds, Washington, just north of Seattle—Rick's mission is to make European travel fun, affordable, and culturally broadening for Americans. Cameron Hewitt writes and edits guidebooks for Rick Steves' Europe. He first visited Budapest on a lark in 1999...and now he can't stay away. From Budapest's colorful and quirky history, to its grandiose architecture, to its mouthwatering food, to its uniquely enjoyable thermal baths, Cameron can't get enough of this enthralling, enigmatic, exhilarating city.